Halo is our pick puppy from Aiden and Dorothy's first litter and we couldn't be more pleased with her!Lots of substance, a beautiful eye , sweet expression and an easygoing temperament lead us to expect a a bright future for our pretty girl! 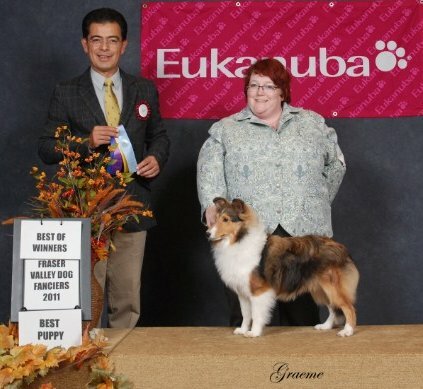 Halo is now Living the life of the Material Girl with Best Buddy Nicole, Look for her in the spring/summer of 2012 when she will be out to finish her championship! Pretty Outline, nice stifle and short hocks. She has nice movement too! Our baby won 4 points on her very first day as a show dog! Talk about starting with a bang! Halo won Winners Female, Best Of Winners, Best Of Winners and Best Puppy in Breed over a huge and very competitive entry at the Fraser Valley Kennel Club on Thanksgiving Weekend of 2011. Thank you to RIcardo Saldana for Honoring our little girl with this exciting win!